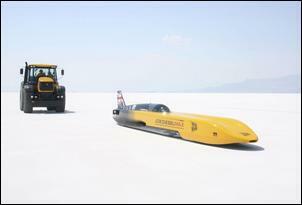 In August 2006 JCB and Ricardo succeeded in breaking the world land speed record for diesel cars – in a vehicle powered by engines originally designed by the two companies for back-hoe loaders! We report on the 19 months of intensive and inspired development work that produced the world’s highest specific power automotive diesel engines and, finally, international glory. This article was first published in Ricardo Quarterly Review and is used with permission. It is mid-morning on 23rd August 2006 and Ricardo’s Matt Beasley, in common with his team of diesel engineers, feels a sense of sheer elation. Together with colleagues at Ricardo and JCB, they had successfully completed a remarkable engineering program that had transformed the existing, co-developed JCB444 engine from a sturdy construction equipment unit into the world’s highest specific power automotive diesel – the JCB444-LSR. It was with this engine that the JCB Dieselmax had just broken the Bonneville SpeedWeek record for a diesel car and set two new FIA certified international land speed records in the space of just six days. 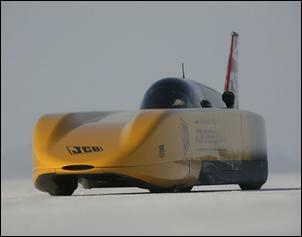 The JCB Dieselmax roared from the drawing board into the history books in a mere 19 months, setting the Bonneville record of 317.021 mph and a new land speed record for diesel cars of 350.092 mph (563.418 km/h). But if the idea of a diesel-powered record breaker was unusual enough, the notion of using the engines from a back-hoe loader – a class of vehicle not usually noted for its speed – for the 350 mph bid appeared extraordinary. 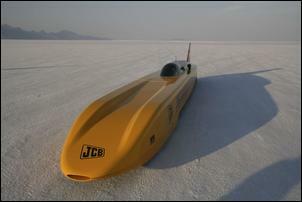 Ricardo had been a natural choice of partner on the JCB444-LSR speed record development program. The company had been powertrain partner on the original JCB444, taking lead responsibility for the original concept development and then gradually handing over responsibility to JCB engineers as the program progressed. It was as part of this program that Sir Anthony Bamford had visited the Ricardo Shoreham Technical Centre and had the inspiration for the audacious landspeed record bid on seeing the first JCB444 prototype being tested. Just two months later, on January 14th 2005, Ricardo’s global diesel director, Ian Penny, joined the first land speed record project meeting at Millennium Point in Birmingham (home of John Cobb’s Railton Mobil Special).The project was shrouded in secrecy and aptly codenamed ‘H-1’ after Howard Hughes’ 350 mph record breaking aircraft of 1935. On Penny’s return to base Matt Beasley was appointed chief project engineer. Work began on the simulation using the Ricardo WAVE software. “Once we had the scope,” explains Beasley, “we could decide which engine components could be carried over and which should be bespoke.” The value of Ricardo’s previous role in the design of the JCB444 engine really came into its own at this stage. “The fact that we had validated CAE models of almost every aspect of the baseline engine enabled us to make rapid progress”, continues Beasley. “We could very quickly predict the durability of components and systems at far higher ratings, safe in the knowledge that the models were of high fidelity and able to provide reliable data.” The feasibility study would take until the end of February 2005, Ricardo’s vehicle division coming up with a basic layout for the car. The favourite was to seat the driver between the two engines and transmissions – but at that point the first sign of a problem came into view. In this configuration the frontal area would be too great, weight would be too high and stability poor. “I suggested we incline the engines,” says Penny, “which meant a lot of extra work but it really was the only solution.” It would also require some complex engineering. “The engine’s lubrication system is designed to drain vertically and, if inclined, would function best fitted ‘cold side’ down. However, in order to fit them low enough in the vehicle, the engines needed to go in ‘hot side’ down.” The team calculated that the best compromise between natural drainage and vertical height was to incline the engines at 10 degrees from the horizontal. To achieve that, the engines would need a bespoke dry sump system. Ricardo calculated that for the speed record attempt, the two engines would require an intake airflow of almost five tonnes per hour. More challengingly still, this would need to be delivered at the 1300m altitude of the Bonneville Salt Flats, where ambient air pressure is 85 per cent of that at sea level. While the production engine requires a boost pressure of 2 bar, the two engines installed in Dieselmax require 6 bar absolute at full power. This compares with around 3 bar absolute for a diesel Le Mans racer, and around 4 bar for the turbo-era Formula 1 cars. The dry sump tank was carefully designed to condition the foaming lubricant, incorporating centrifuge separators and baffles through which the oil flows, in order to remove the air from it. It would take five layers to achieve a satisfactory result, but the bottom layer would consist of pure, air-free oil. If the engine is the heart of the vehicle, then the combustion system is very much the heart of the engine, and the JCB444-LSR engines were from the outset designed using Ricardo’s High Speed Diesel Race (HSDR) direct-injection combustion technology. Fuel is delivered via two parallel high-pressure pumps to a common-rail system providing an injection pressure of 1600 bar. Modifications had to be made to the cylinder head to facilitate the larger injectors required for the HSDR system. Despite these changes, however, the team decided that the valve train could be carried over substantially in its original form, with the exception of high-temperature specification exhaust valves, up-rated valve springs and a modified camshaft profile. A completely redesigned piston is used with a large, quiescent combustion chamber that has a reduced overall compression ratio and specific features to reduce the risk of thermal damage to the combustion chamber components. Piston cooling was improved over the baseline design by increasing the cooling oil flow to each piston by around 600 per cent. A completely new, fully machined connecting rod was used, including a significantly enlarged small-end bearing to increase strength and robustness. While giving a longer stroke, the billet-machined crankshaft retains the production main and big-end bearing sizes and bearing shells. By now, the team was well into the concept validation process scheduled to run from March to August, and by July it had the specification for the first engine mule. Following an exploratory visit to Bonneville for the 2005 Speed Week, the streamliner’s design had been refined, becoming even narrower; the track and wheelbase were modified too. Finding suitable tyres proved a major challenge. Land speed record tyres are available off-the-shelf, but the manufacturers only provide a 300 mph speed rating. To make an informed decision as to their suitability to run a 2700 kg car at over 300 mph, the team required validation at target load rating and running pressure. In the end, JCB located a suitable high speed tyre rig and independently validated the tyres to 350 mph, the maximum speed of the rig. Final approval for the project was provided in September 2005, but in view of the three month lead time for the procurement of parts there was considerable pressure to get an engine running. Given the high power rating, it had already been decided that the engine required a solid billet crankshaft, a component which would inevitably require a long lead time. Luckily, Greville Sharman, Ricardo chief designer on the original JCB444 program, remembered that one of the very first development prototypes of the JCB444 engine had been produced with just such a crankshaft and was on display at JCB headquarters. Swiftly requisitioned by the Dieselmax team, it was rushed to Ricardo and stripped, allowing Matt Beasley’s team to run the first engine test on October 18th at 10 am. From February through to May 2006, with the record attempt looming in August, a significant development effort went into refining the design of the near-horizontally installed, dry sump version of the JCB444-LSR land speed record engine. When pushing the limits of performance into territory that no other engine developer has ever previously explored, some component failures are to be expected and are an inevitable part of the learning and development process, enabling subsequent prototypes to achieve better durability and greater performance. 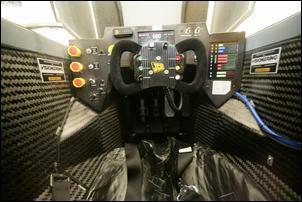 By May the fuel system was further developed and the first stage engine configuration frozen at 600 bhp. It was this specification that would ultimately run in the early vehicle tests and take the Bonneville speed record. By the end of June, both of the 600 bhp Bonneville speed record engines were complete and ready for installation in the vehicle. Now ready and fitted with the 600 bhp units, the car was dispatched to RAF Wittering airbase along with half the engine team, the other half remaining to continue engine building. Four weeks’ UK vehicle testing had been planned, but the enormous challenge presented by raising the power output of the JCB444-LSR engines by 600 per cent and building a bespoke streamliner vehicle had nibbled away at the schedule, leaving the Dieselmax team with just 14 days to complete the task. Furthermore, the test criteria were tough: reaching 200 mph on the 1.7 mile course, a speed equivalent to the world’s fastest roadgoing supercars. Despite pressure to change the engine, Beasley resisted; the amount of work would have been too great. Instead, the team spent a day and night investigating and eventually discovered a failed injector seal and a water injection system malfunction. Diesel injectors are precision components normally assembled in near-surgical conditions, but this option was not open to Beasley. Instead he decided to strip and reassemble the injector in situ, working in a tent on the airfield, at two in the morning. It may have been unconventional but it worked, and the Wittering tests not only yielded a maximum speed of 201 mph but the engine team was also able to sign off all of the 60 items they had been monitoring. Some boost lag had been evident but not critical. 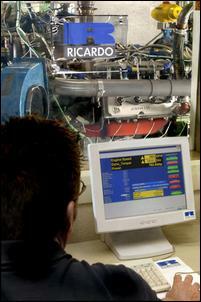 In parallel with the Wittering tests, part of the team continued to work at Ricardo on the development of the final specification of the engines. On July 17 the announcement was made that the 750 bhp power target had been achieved and attention was turned to the preparation of the two FIA-sealed engines which would be fitted to the vehicle for the international speed record attempt. By the end of July the land speed record engines were complete, having been sealed by the FIA following verification of the bore and stroke. 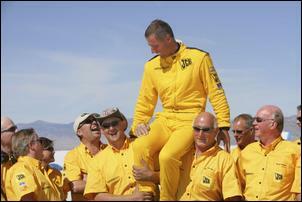 The team, plus the car, arrived at Wendover airfield near Utah’s Bonneville Salt Flats on the Sunday. The team had planned to use Speed Week as a final test of the vehicle specification before attempting to take the international record one week later. 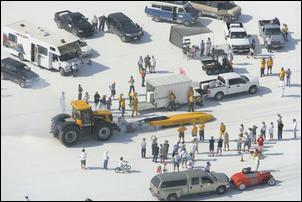 A comprehensive risk analysis of the car and engines was used to determine the approach to be taken throughout this period so that the final development time at Bonneville – the only place that the vehicle could ultimately be tested in the environment of the record attempt – could be used to best effect. By the Thursday before the start of Speed Week the team had reassembled the car, made the first shakedown runs and noticed an increase in turbo lag due to the high altitude. The first run on the salt on Saturday afternoon revealed that something more than minor recalibrations would be needed. Because of the car’s layout, the exhaust system of the rear engine is longer than that of the front and, since the air pressure is some 15 per cent lower at Bonneville than Wittering, the front engine turbo was boosting two to three seconds before the rear. With the front engine doing all the work and with no load on the rear engine, its turbos simply refused to come onto boost at all. Saturday August 12th, the first day of Speed Week, yielded a peak speed of only 163 mph before the team ran out of time on the salt. Sunday was even more frustrating when, after a three-hour wait to get a run, they were still unable to solve the boost problem. 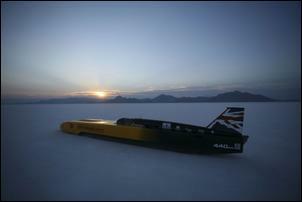 On Monday 14th they achieved 226 mph on the salt but still could not encourage the rear engine to boost. “226mph was not bad,” says Beasley, “considering the front engine was doing all the work.” To overcome this situation he decided to reduce the fuelling of the front engine in first gear, giving the rear engine a chance to catch up. But when they returned to the salt on Tuesday, the problem reversed and the front engine failed to boost. In order to resolve this issue once and for all, Beasley and his team decided to fit a balance pipe between the induction manifolds of the two engines to equalise the pressure on the air side of the turbos. They worked through the night on this solution but in parallel, they also developed a novel run strategy which mirrored the way in which the JCB444-LSR engines were tested at Ricardo – initially applying load at low speed to raise the exhaust temperature before allowing the engine to go onto boost. While this is done in the test cell through applying load through the dynamometer, the same could be achieved by applying the brake under power during the early stages of a record run. Wednesday morning dawned and the modified Dieselmax made six runs at Wendover airport with driver Andy Green using the new ‘left foot brake’ technique to raise the exhaust temperatures to over 400 degrees Centigrade. It was one of those Eureka moments as both engines came cleanly onto boost for the first time since the car had been run at Wittering: the machine accelerated as never before. Maddeningly, though, strong cross winds prevented a run on the salt that afternoon. By Thursday afternoon, however, with good salt conditions and all engine and vehicle development issues resolved, the Dieselmax performed exactly as intended, achieving a measured mile speed of 308 mph. 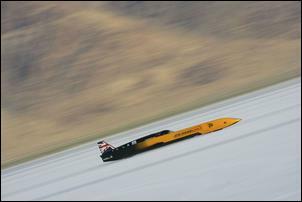 On Friday, in the cool of the early morning, they returned to make the second run and Andy Green comfortably averaged 325 mph, setting a new Bonneville record of 317.021 mph. 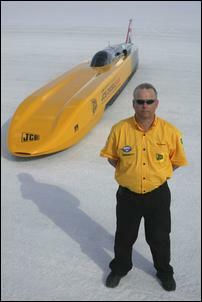 The Dieselmax had become the fastest ever diesel to run at Bonneville but, unbeknown to outsiders, Green had missed the mile marker and hit 350 mph beyond the measured mile. “The car was developing just over 1000 bhp from itstwo engines at the time, was not yet at full boost and still in fifth gear not sixth, so everyone gained confidence for the world record attempt,” says Beasley. Now for the big one: the official FIA land speed record for diesel cars. With Speed Week over, the team returned to Wendover in order to fit the 750 bhp engines for the attempt. “There was some pressure to leave well alone, to leave the existing engines in place now we had them sorted, but I knew they had done their allotted work,” recalls Beasley. Yet when running the new engines for the first time on the Monday morning, a fuel pump oil seal failed, causing further delays. At dusk there was just time for a few test runs on the airfield runway. Returning to the salt on Tuesday, they prepared for the first record run and the car was ready on the start line before dawn. Green left the line, pushed by the JCB Fastrac as usual, on what looked like a promising start. Then, just 1.5 miles into the first run, disaster struck and the Dieselmax coasted to a halt, Green reporting a ‘total power failure’ over the radio. As it turned out, a chafed wire beneath the dashboard had killed the electrical systems. With the fault repaired, they tried again. The first run average was 324.265 mph, despite the engines overheating and the power being automatically reduced by a fifth. On the return run, made with just 11 minutes to spare before the one hour cut-off, Green averaged 333.364 mph, giving a two-way average of 328.767 mph and setting a new international record in the process. The team was ecstatic. 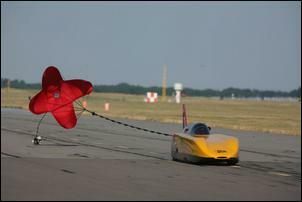 “Andy ran to the 330 mph target but the speed climbed to 345 mph. He backed off, but inadvertently hit the exhaust brake when he did so, decelerating the car by some 20 mph,” says Beasley. It was a fantastic result but the decision was taken to return the following day and attempt to raise the bar still higher. “The outcome of this project has a significant influence on the application of diesel engines and our own range in particular. The increase in power means the break point at which a six-cylinder engine becomes necessary has risen – and this clearly has major commercial implications. The compact power unit gives us more scope in terms of the type of vehicles we can design. “It was a classic record car experience but the diesel engine made it unique. Sluggish at slow speed, when it suddenly came onto boost the car would just take off. The left foot brake technique we developed to overcome the boost problem at high altitudes produced far better acceleration than we experienced, even during the UK tests. In the end, the car ended up being so fast at the top end that it outstripped all expectations.